All Equity Funds absorbed a 13-week high of $6.5 billion. Redemptions from Money Market Funds, which posted record setting outflows of over $60 billion the previous week, fell to just over $6.4 billion. U.S. equity flows have just achieved their best winning streak in over six years. US Equity Funds posted a seventh straight week of inflows, their longest winning run since a nine week stretch that ended in 4Q04. 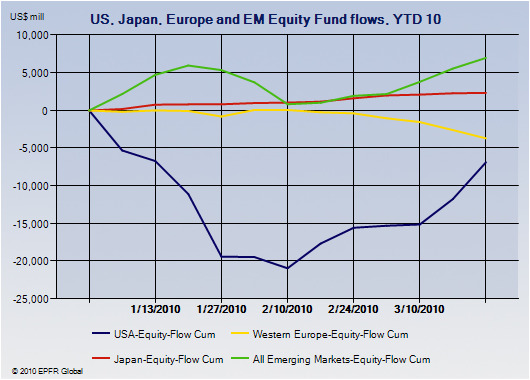 Year to date flows into these funds are still in negative territory, losing $6.9 billion to outflows, but have taken in about $14 billion over the past six weeks. Large Cap ETFs were the main money magnets in the latest week. Still, those for Europe were negative as of this latest data, as shown by the falling yellow line below. Note the sharply rising blue line for the U.S.. Yet given the news of a more tangible Greece bailout, one wonders if European equity flows will bounce back since the euro itself is already rallying. The bulls are back, which is good news for those looking for momentum, but the beginning of bad news for those who prefer to invest into equities as contrarians.